These hand painted thank you cards were so much fun to make! Making your own cards is a great way to foster gratitude and the perfect excuse for some crafty fun. My kids were so proud of how nicely their hand painted thank you cards turned out, and they cannot wait to mail them off to faraway family and friends! A big thank you to our friends at Melissa & Doug for sponsoring today’s creative craft project!! This would be such a nice activity to keep the kids entertained on a rainy day. Liquid Watercolors — We LOVE the leftover paint from this Magical Masterpieces set! The colors are very vibrant!! Paintbrush — We used the one from the Magical Masterpieces set. Fold a sheet of white card stock paper in half to form your card. 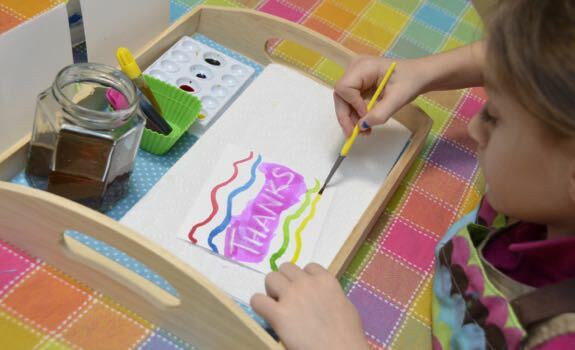 Use the white crayon to write phrases like “Thanks” or “Thank You” across the front of each note card. Invite your child over for some painting fun! 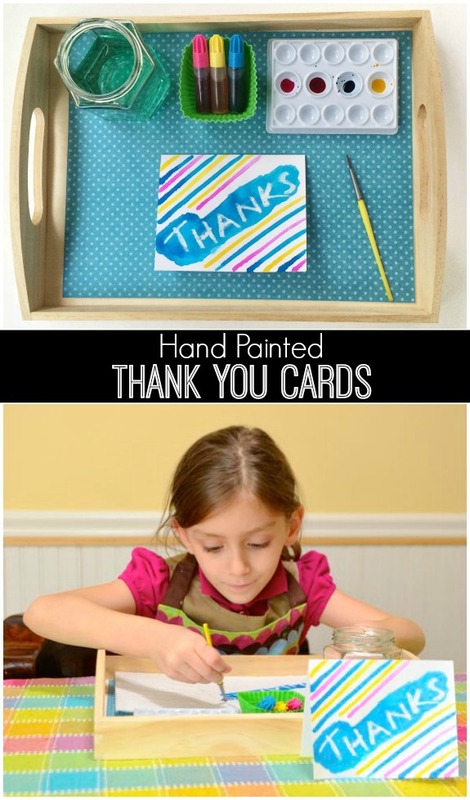 Encourage your child to paint over the entire front of the card to reveal the “Thank You” message. My six year old thought that the letters appeared like magic! Soon my kids were asking to make several different versions of these lovely crayon-resist hand painted thank you cards! I love that it didn’t take her long to figure out how to mix colors to create different color combinations for her cards. Every card was unique! Making these hand painted thank you cards kept the kids happily occupied for a long while, and they are so excited to drop these in the mail!